Voting starts in 4 months. Music, even music without lyrics, can tell a story and the Celts made some of the most haunting and beautiful music in the world. Celtic music is a tradition carried through even today and it seems to becoming more popular than ever before in 1999 Loreena McKennitt had a number one hit on many radio stations in America with "The Mummer's Dance" and the band Clannad won a Grammy for their album "Landmarks" in the New Age catagory.The best selling soundtrack to the movie "Titanic" had a very Celtic feel to it and the Celtic pub band Gaelic Storm who made an appearance in the movie released their debut album shortly thereafter. From traditional Celtic music to the new sounds of Steve McDonald and Ceredwen you'll find links to various bands and labels here plus when we can we provide tour schedules. Here at Seanchaidh once a year usually in March we have The Seanchaidh Music Awards in which you the visitors to our site can pick the Celtic artists you like best in various catagories.The rules and everything will be posted on the last day of January.On the bottom of the page you will see our Pick of the Month. Every December we post the lyrics to Auld Lang Syne by Robert Burns the Scottish drinking song sung every New Years Eve. The first table lists artists the second table lists record labels.We only list artists with a web site if you know of someone we left out or wish to see included let us know.We have few listed but plan on adding more constantly. Click on the album cover to purchase direct from the label. 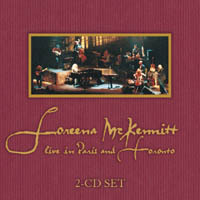 Ms. McKennitt's latest release is a live double cd set it is until the 28th of September available ONLY from her record label Quinlan Road this is a benefit album as well.Loreena McKennitt is the two time winner of Canada's Juno Award (similar to the American Grammy).